This stunning bottle stopper depicts a copper-colored maple leaf in a beautiful shade of the autumn season. Each 4-1/2" stopper is crafted of heavy metal with a rubber stopper and bright copper finish. 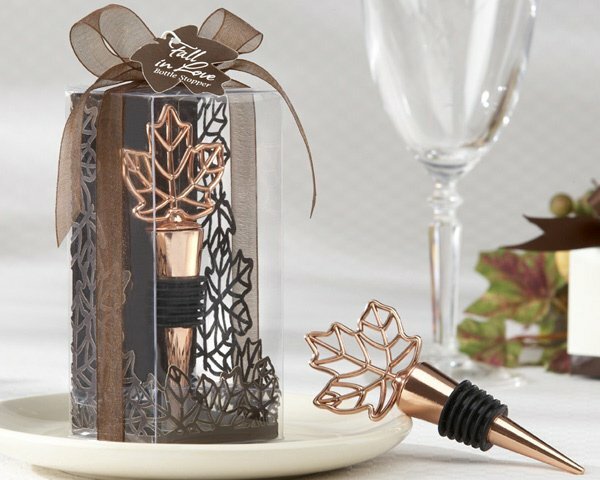 The stopper is beautifully presented in a clear plastic gift box with intricate chocolate-brown laser-cut leaves, brown organza bow and a leaf-shaped tag with the message of "Fall in Love". These fall wedding favors are an elegant addition to any autumn themed event! Was wondering if these bottle stopper are sold separate or 2 together? This Fall Leaf Bottle Stopper with Copper Finish is sold individually. 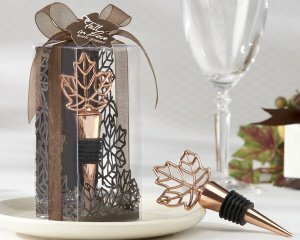 Wondering about the quality of Fall Leaf Bottle Stopper with Copper Finish. Is it copper plated? The quality of the Fall Leaf Bottle Stopper with Copper Finish is good. They do tarnish some due to it being a copper based product. Also, it is a popular item with not many returns on them. Do you have a sample of Copper Leaf Bottle Opener Favor? Yes, a sample is available for this Fall Leaf Bottle Stopper with Copper Finish. Just enter 1 in the quantity box and click 'add to cart' to continue to the check out.